Punch Brothers is an American band consisting of Chris Thile (mandolin), Gabe Witcher (fiddle/violin), Noam Pikelny (banjo), Chris Eldridge (guitar), and Paul Kowert (bass). Their style has been described as "bluegrass instrumentation and spontaneity in the structures of modern classical" as well as "American country-classical chamber music." The band's most recent album, 2018's All Ashore was awarded the Grammy Award for Best Folk Album at the 61st Grammy Awards on February 10th, 2019. 1.5 2012: Who's Feeling Young Now? We got together one night just to drop a ton of money, drink too much wine, eat steaks, and commiserate about our failed relationships. We had gotten to play together a few days before and we had said that we needed to do something musical together. With our hearts smashed to pieces, it became more urgent — our lives had gone the same way for so long. I knew I wanted to have a band with Gabe [Witcher], but I didn’t know if it would be a rock ensemble, an ambitious acoustic classical thing or a bluegrass group. We played, and there was a serious, instantaneous connection. Then I knew I wanted to put together a bluegrass band — one with a lot of range, but aesthetically a bluegrass band. Initially the band was known as The How to Grow a Band. 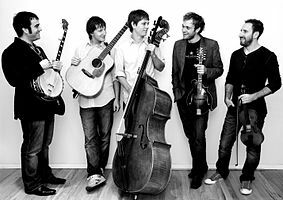 In 2007, the band officially changed its name first to The Tensions Mountain Boys and then settled on Punch Brothers. The band's name comes from the critical line of an earworm jingle that is the centerpiece of Mark Twain's short story "A Literary Nightmare". The chorus of the jingle consists of two lines, "Punch, brothers! punch with care! Punch in the presence of the passenjare", that are said to be the mantra of railroad conductors. What they formed was a type of group that American Songwriter magazine calls "A 21st century version of the Bluegrass Boys." On March 17, 2007, this group debuted Chris Thile's most ambitious work to date at Carnegie Hall: "The Blind Leaving the Blind", a forty-minute suite in four movements. Thile says the piece was written in part to deal with his divorce of 2003. On February 13, 2008, the band set off on their first national tour as Punch Brothers. On February 26, they released Punch, their first album, on Nonesuch Records. The album features Thile's suite "The Blind Leaving the Blind", as well as other original songs. In March 2008, when asked about a follow-up album, Thile said "there will definitely be another album." On November 8, 2008, the band announced on their website that they had parted ways with bass player Greg Garrison. Paul Kowert, who studied under Edgar Meyer at the Curtis Institute of Music, took Garrison's place as bass player. 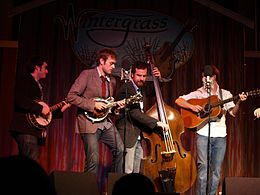 Antifogmatic, the Punch Brothers' second album, was released on June 15, 2010 and features both traditional bluegrass and newgrass styles on the ten-track listing. Though bassist Kowert toured extensively with the band in support of Punch over the last two years, Antifogmatic is the first Punch Brothers album on which he appears. The band is also the focus of the documentary How to Grow a Band, directed by Mark Meatto. It was filmed over a two-year period and, according to its website, "explores the tensions between individual talents and group identity, art and commerce, youth and wisdom." The film premiered at the 42nd Nashville Film Festival in Nashville, Tennessee on April 15, 2011. The film also screened as part of the 38th Annual Telluride Bluegrass Festival in June 2011. The band released its third album, Who's Feeling Young Now?, in February 2012. Shortly afterwards, they contributed the song 'Dark Days' to the soundtrack for 2012 blockbuster The Hunger Games. In November 2012 they released Ahoy!, the 5-track EP companion to Who's Feeling Young Now? Ahoy! consists of five songs recorded at the same time as Who's Feeling Young Now? that were not featured on the full-length release. In November 2014, the band released the first single, entitled "I Blew It Off," from their then-untitled fourth album. In December 2014, the band announced that the new album, The Phosphorescent Blues, would be released on January 27, 2015, along with the immediate release of another new single, "Julep." Julep was nominated for Best American Roots Song at the 2016 Grammy Awards. The album reached the top 10 on the rock, folk, and bluegrass charts. On November 20th, 2015, the Punch Brothers released a 5-track EP, The Wireless. On July 20, 2018, All Ashore was released as the band's fifth album. The album was self-produced and released on the Nonesuch Records label. According to Thile, the album is "a meditation on committed relationships in the present day, particularly in light of the current unsettled political climate—certainly the most unsettled one that anyone in the band has ever experienced. We were hoping we could create a thing that would be convincing as a complete thought, sort of a nine-movement or a nine-song thought, even though it's rangy in terms of what it's talking about and in the characters doing the talking." All Ashore was awarded the Grammy Award for Best Folk Album at the 61st Grammy Awards on February 10th, 2019. ^ Paphides, Pete (January 25, 2008). "Chris Thile and his mandolin". The Times. London. Retrieved May 22, 2010. ^ Holden, Stephen (February 22, 2008). "Covers and Classical Moves From a Bluegrass Virtuoso". The New York Times. ^ a b Press, The Associated (2019-02-11). "List of top winners at the Grammy Awards". AP NEWS. Retrieved 2019-02-12. ^ "Nickel Creek's Thile 'grows' a new band". Nashville City Paper. 2006-08-23. Archived from the original on 2006-08-26. Retrieved 2007-10-13. ^ "Punch Brothers: Punch". Amazon.com. Retrieved 2010-04-23. ^ "Punch Brothers: American Pickers". American Songwriter. Retrieved 31 May 2012. ^ "Nonesuch Records Signs Singer/Composer/Mandolinist Chris Thile and His New Band, Punch Brothers". All About Jazz. 2007-10-09. Archived from the original on 2007-12-25. Retrieved 2007-10-10. ^ "Now out of the Creek, Thile's packing Punch - The Boston Globe". Boston.com. 2008-04-05. Retrieved 2015-03-18. ^ "Punch Brothers". Punchbrothers.com. Retrieved 2015-03-18. ^ "The Phosphorescent Blues – Pre-Order Now". Punchbrothers.com. 2014-12-04. Retrieved 2015-03-18. ^ "2016 Grammy Awards Nominees Announced". The Boot. Retrieved 2017-04-06. ^ Mason, Anthony (2018-07-28). "Punch Brothers on bluegrass, collaboration and the band's "instant mind meld"". CBSNews.com. Retrieved 2018-07-30. ^ "Chris Thile Talks Strumming Through the Apocalypse With Punch Brothers". Billboard. Retrieved 2018-07-31. ^ "The Story Behind Punch Brothers' New Album, "All Ashore" - Nonesuch Records". Nonesuch Records Official Website. Retrieved 2018-07-20. ^ "Punch Brothers Chart History". Billboard. Retrieved 2018-07-31. ^ "CMT : Videos : Punch Brothers : Movement and Location". Country Music Television. Retrieved January 25, 2013. This page was last edited on 12 February 2019, at 18:58 (UTC).